"Did you like Unitopia? Did you regret his death? You can be happy: the succession is assured!" For his first album, Damanek (a contraction of the names of his three founders) had alerted the progressive community with a production at the crossroads of Unitopia and Toto. The reference to the late Australian band that delighted us in the 2000s is not insignificant: it is simply that with "In Flight", and even more so than Southern Empire or UPF, Damanek is a worthy successor to the band formerly conducted jointly by Marc Trueack and Sean Timms.... the latter having taken a greater place within the group, responsible for the final mix and production among others. 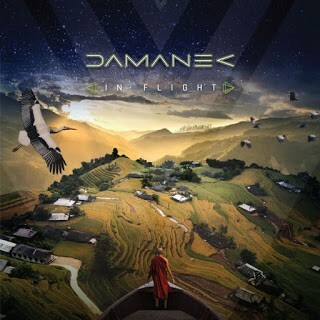 With "In Flight", Damanek invites us on a journey with a very diversified musical content, from symphonic pop to jazz, from progressive to AOR, all with a strong sense of melody and arrangements. It is not surprising when you look at the composition of the band and the origin of its different members, as well as those of the different guests: Unitopia, UPF, The Tangent, Maschine, Toxic Smile etc., all renowned for combining the word "diversity" in many ways. Emblematic title of this melting pot, "The Crawler" takes us away for a musical mix where we find (great) Asia with an unstoppable chorus, the rhythms and saxophone typical of Unitopia, but also a jazzy section evocative of The Tangent. Eclecticism is also found in a track like "Skyboat", where Damanek gets closer to Jethro Tull, before striking a keyboard solo worthy of the great Manfred Mann. This does not prevent the band from giving some bluesy accents to the ballad "Moon-Catcher". But the great work of this CD undoubtedly lies in'Big Eastern', a 30-minute triptych where the melancholy of Marek Arnold's saxophones is set against beautiful symphonic arrangements, welcoming some orientalizing passages or other percussions and sounds typical of the Down Under. And what about the different themes served by melodies as bright as they are full of emotions? They reveal themselves with emphases, disappear gently to reincarnate better a few seconds, a few minutes later. It is impossible not to succumb to this enchanting frenzy, especially when a good solo by Luke Machin comes to delight us. Finally, a final word to underline the quality of Guy Manning's singing. He shows us here that his voice perfectly matches the eclecticism of the 61 minutes of "In Flight", well supported by the many choirs that surround him. Where the first album, already excellent, presented some small mistakes, "In Flight" captivates from the very first seconds, not to let you go. Great art, undoubtedly. Did you like Unitopia? Did you regret his death? You can be happy: the succession is assured! Did you like Unitopia? Did you regret his death? You can be happy: the succession is assured!